Turning one is a big moment for your little ones. Once your baby turns one, the walking and talking usually begin. You may also find that your one year old has turned into a busy bee, and it may be hard to keep them entertained throughout the day. Here are some of my favorite activities for one year olds. The best part is that they are affordable and easy to do. Meetup.com is a free site that allows to create groups for the purpose of meeting up. Look for local mom groups in your area or start your own. One year olds may not know how to play together yet, but it can be fun to get together with other moms. At first, I thought a water table was a must-have, until I saw the price of them. Paying $35-50 for a plastic table that holds water for a baby/toddler is a little ridiculous in my book. Instead of investing in a water table, try making your own with a plastic box or under-bed storage container. You can also set out a big bowl of water with a little bit of dish soap for your baby to play in, wash their toys, or blow bubbles. You can even give them an affordable paintbrush so that they can “paint” with the water on driveway. Another fun idea is to make a colander by poking holes in a Styrofoam cup or bowl. If you type in the phrase “Sensory Box” in Pinterest, you are going to find an abundance of ideas. Sensory boxes do not have to be anything complicated. In fact, we have two plastic shoe boxes full dried beans and split peas and rice and noodles. I also threw in an extra measuring cup and spoon I had in the box. The problem with sensory boxes is that babies can put the contents in their mouth, which is why supervision is important. Look around your house for everyday items that may appeal to your baby, then stick them in a box or basket, and let them have fun. What if I told you that your town has a free zoo? It’s true! It’s called the pet store and most one year olds love it. We live an hour and a half from the LA Zoo, so making a day trip would be costly. Instead, my daughter and I go to the pet store, Petsmart or Petco, about twice a month. We usually go on pet adoption day so that we can see all of the dogs and cats. You may not see a giraffe or elephant, but your little one will most likely love seeing a variety of birds, fish, and other small animals. One thing I have learned is that one year olds love to experience new things. They are so curious about the world around them, so it is only natural for them to want a change of scenery every now and then. These frugal activities for toddlers will help keep your baby busy while also helping them developmental skills. How do you keep your one year old entertained and out of trouble on a budget? 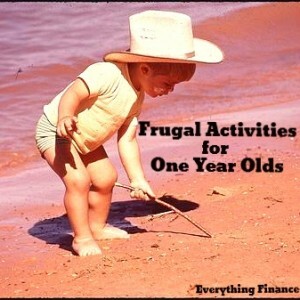 Stay tuned for more frugal activities for toddlers.